Finally, I shall also present a new level editor which will allow you to place game entities and modify their properties, in turn giving way to a new level definition format for our level files (the level editor also contains a lot of other minor improvements and bug fixes). Do be sure to work through these 5 parts in order as each builds on the code from the previous parts. In this part we’re mostly going to just look at the internal organization of game entities without actually adding any new visible features to our project. Although this is a platform game series, the concepts and code structure can be applied to most any type of game, however the implementation will be completely different for different game genres. When we talk about a framework, it’s important to note we are not talking about a re-usable framework as such, since most games have a much larger percentage of custom code than other types of application, due to their specialist nature. Nevertheless, the principles apply to any game where you need to manage a large number of entities with related but different behaviour. For example, the code can be re-purposed to manage NPCs (non-player characters) in an RPG, specifying for example their dialogue, whether they are a merchant or quest-giver (and which quests they give and under what conditions) and so on. An obvious question might be, why would we want to store entity data in class objects at all, especially when you consider that say a coin has fundamentally different properties and behaviour to an enemy? Is it object-oriented programming for the sake of it with no real benefits? Many entities will also be moving around and need their speed and acceleration tracked, and static (non-moving) entities are easy to integrate into this system because they simply have a speed of zero. When we place a game entity of a specific entity type into the game world, we call this creating an instance of the entity type. For example, we define a coin as an entity type; if we then want to place 100 coins in a level in various locations, we create 100 instances of the coin entity type (or 100 entity instances of a coin, or 100 coin instances; these phrases are interchangeable and mean the same thing). These instances will have certain properties which are specific to the instance being created, eg. position in the level. There are lots of dilemmas to consider when structuring the entity hierarchy. Some entity types may have properties which are not shared by other entity types, yet are the same for all instances of the entity type which has the property (for example, all coins (the entity type) may have a base value of 100 points (the property shared by all coins, ie. all instances of the entity type), while enemies don’t have a base value as they are not collectible items). On the other hand, some entity types may have properties which may be different for each instance of the entity type (for example, each switch may have a target door it opens, and this target door will be different for each switch created). In addition to sorting all of this out into a class hierarchy, we need to provide behavioural hooks both at the entity type (collect coin, add points value to score) and instance (flick switch, open target door) levels, and organize the hierarchy in such a way that only the required properties are stored in the level file, both to avoid duplication of shared properties and to make those properties adjustable later if we need to globally change the behaviour of an entity type. Polymorphism – the game code, including collision detection, rendering and behavioural processing will not need to care what type of entity is being operated on, as they can all be treated the same. This reduces code duplication, increases ease of maintenance and promotes extensibility: new entity types will be much easier to add, as they only require using an existing class with changed default properties, or deriving a new class which will be handled via polymorphism by the rest of the game code. In other words, all three of the traditional “pillars of OOP” apply well to our use case. RTTI (Run-time Type Information) / Type Reflection may be required – the whole point of polymorphism is that we shouldn’t need to know the precise type of the object we are dealing with. However, with the level editor in particular, we will need to inspect the class type of each entity so that the user can be presented with editable properties sheets relevant to the specific entity type and so on. If we choose to go even further and integrate platforms (world geometry) and entities into a single list of world objects, there are collision detection situations which apply to platforms but not entities, so we must be able to differentiate them. The type information problems can in fact be solved by careful design. For example, we could provide a virtual function overridden by the base platform and entity classes which report how collisions should be detected. For the level editor, we could implement virtual functions for each entity type which return a list of editable properties, their types and range bounds, then program the level editor to dynamically create a window (or dialog box or property sheet) from this information. Such a solution, however, is very laborious and time-consuming, and adds a lot of unnecessary bloat to the classes just for the sake of the level editor (we workaround the problem below by embedding an entity type identifier field into each entity type class, which the level editor can inspect to find out its actual type even if it is referencing it from a base class pointer). If you need it, refer to the article C++ Class Hierarchies: Derivation (“is-a”) vs Composition (“has-a”) and Is a Square a Rectangle? on this site for a quick crash course refresher on designing class hierarchies. We will be making extensive use of the techniques and design justifications described therein below. First it is important to understand that the framework we will construct to handle all the situations outlined above is not necessary for simple games. There is no need to go into the complexities discussed if you only have one or two types of enemies and a few collectibles (coins, power-ups etc.) in your entire game. The approach described here is generally applicable to “medium-sized” games where there are perhaps some dozens or a couple of hundred different entity types. To implement this framework for very simple games is overkill. Please note also that I do not show every single changed line of code from previous parts in the series below, just the relevant stuff; there are numerous boilerplate and organizational changes and I encourage you to WinDiff (or other diff tool of your choice) the source trees for Part 11 and Part 12 (this part) to study the changes in more detail. Figure 1 shows the layout of the framework in C++ classes, with base classes in blue and derived classes in orange. Take some time to refer back to this diagram as I explain it in more detail below. We’ll disregard the implementation of the actual player for now and return to that in Part 16. The basic idea is that we divide up all the properties and behaviours we need into three class groups: those with base types of GameEntityTypeDefinition, GameEntityDefinition and GameEntity. We then relate them to each other so that a live instance of an entity can find its own unique default properties and behaviours, and properties and behaviours shared by every entity of its own entity type. Figure 2 shows how these are rolled up into our framework, with detailed explanations below. GameEntityType is an enum with one entry for each possible type of game entity, including the player. We use it as a key for the GameEntityTypes dictionary which will contain one entry for each possible game entity type, with that type’s shared default properties. 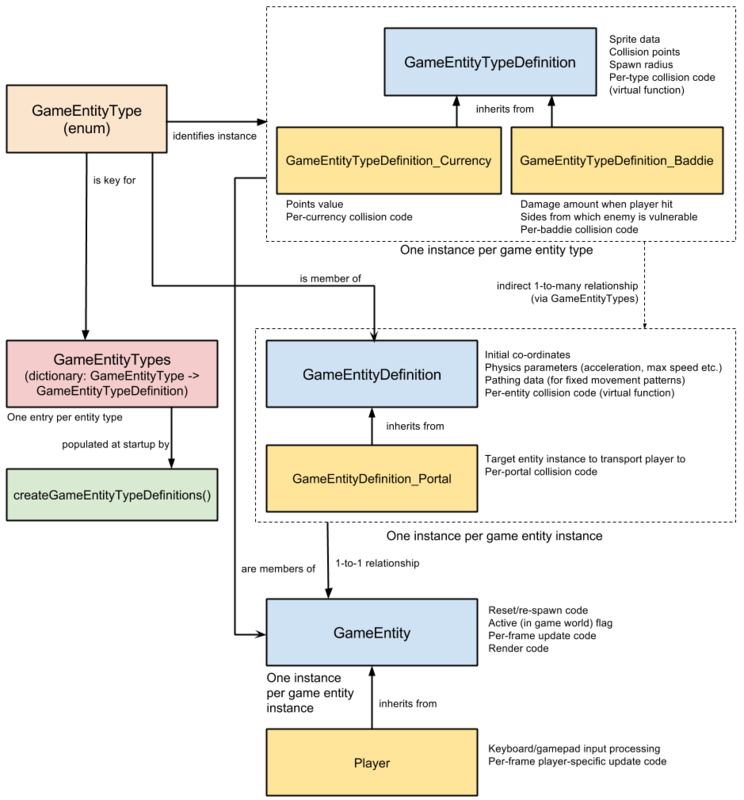 GameEntityTypeDefinition defines properties and behaviours which all game entities of the same type share and forms the values of the GameEntityTypes dictionary. One GameEntityTypeDefinition for each possible entity type is created with type-specific values when the application starts, and these values are shared by every entity with the same type. The base class contains properties which all entities of all types require, such as sprite and animation data. The class may be derived to provide additional properties and behaviours shared by all game entities of a particular type but which are not needed by all entity types; these properties and behaviours are shared among all instances of the type defined. Let’s see how all this works in code. The details aren’t too important but as you can see, the base entity type defines sprite animation data, the object width and height and collision test points (check Part 1 for more details on this) – things that will be required by every single instance of every entity type. We define a Currency derived type which has a points value to add to the player’s score when the currency item is collected, and a Baddie derived type which specifies how many hit points to damage the player by and on which sides the enemy is vulnerable to attack. Note that we just use stub functions for the collision processing for now. Notice that these properties are not only shared but the same for all instances of a particular currency type and a particular enemy type respectively, ie. all Star currency types may have a value of 100, and all BigStar currency types may have a value of 500. The reason we do not define a Portal type here is because, while portals share a target co-ordinates property to transport the player to, this property is not the same for all instances of a portal – it is different for every portal. // but can be killed by jumping on it. // A generic baddie which damages the player on collision and can't be killed. We populate GameEntityTypes with one entry for each entity type. Note that the Portal type is created using the standard GameEntityTypeDefinition base class as it does not have any additional properties that have constant values for all portal instances. The Star type has a static (not moving in any direction) animation and gives 100 points to the player on collision. The EvilBurger type has left and right animations, does 20 hit points of damage to the player on collision, and is vulnerable to attack from above (by jumping on it). The Barrel type has left and right animations, does 50 hit points of damage to the player on collision, and cannot be destroyed (Note: having left and right animations does not mean the entity cannot move up or down; it only means that the animation displayed depends on whether the entity is facing left or right). The Portal type has a static animation of 1 frame (meaning that it does not animate – it uses a single sprite) and no other shared properties. Now we have our entity types defined, we can go on to create individual instances of these entity types in a specific level. GameEntityDefinition defines an instance of a single game entity in the game world. It has an entity type field (of type GameEntityType) from which its corresponding GameEntityTypeDefinition (or derived class thereof) can be looked up for the information defined above. GameEntityDefinition may be derived to provide additional properties and behaviours shared by all instances of a particular entity type, but whose values must be set individually for each instance. The portal is the example we are using here, where each instance must have its target location set individually. An array of GameEntityDefinitions represents all of the entity instances for a specific level or area in the game. Instances of GameEntityDefinition will describe (among other things) the movement and collision behaviour of each entity instance. To simplify this, we define a few enums first. Sine and cosine movements are great for objects which speed up and slow down in an oscillating fashion, or move in a circular or elliptical pattern. The Standard model uses the default game physics regardless of the platform the entity is on. The Platform model uses the physics model defined by the platform the entity is on (see Part 5 on platform surface dynamics for more information). We use negative numbers in the enumeration because a positive number will be used to give entities their own custom-defined rate of acceleration. The comments should make this fairly self-explanatory. All of these properties are required by every instance of every entity, but most of the values will be unique for each entity, which is why we don’t define them in GameEntityTypeDefinition. We add one field to the derived class – targetEntityId – which specifies the ID number of the entity instance to which the player will be teleported when she collides with the portal. Quizzical readers may at this point wonder why GameEntityDefinition doesn’t just include its associated GameEntityTypeDefinition as a member or pointer member. The answer is basically to do with type reflection, object cloning and serialization in the level editor. I won’t go into the level editor code here but see the supplied source code for the details. Another solution is to use the CRTP, but see my article C++: Polymorphic cloning and the CRTP (Curiously Recurring Template Pattern for an explanation of CRTP and to see what a mess that creates. I tried a number of solutions for this problem but in the end a simple dictionary was the simplest if not most elegant solution. The constructor takes a reference to a GameEntityDefinition so we define an ’empty’ one in _GED_Empty for when the default constructor is needed (the default constructor is required since the instances are stored in another unordered_map, for which class entries must have a default constructor). From the GameEntityDefinition, the constructor uses the typeId field to look up the corresponding GameEntityTypeDefinition from the GameEntityTypes dictionary and include a reference to it as a member of GameEntity. This just saves us from looking it up every time we need it. There is a 1-to-1 mapping of GameEntityDefinitions to GameEntitys: for each GameEntityDefinition there is exactly one and only one corresponding GameEntity. The reason we separate the classes at all is to avoid saving unnecessary data in the level files. This works exactly the same as how we created exactly one Platform for each stored GeometryDefinition earlier in the series. As you can see, everything is a stub function which we’ll fill in later except that Reset() puts the instance in a non-spawned state and the parameterized constructor fetches the entity type from GameEntityTypes as described above. Later in the series we will show how the GameEntity class can be derived both to represent the player, and to add additional ‘live’ properties for instances of a particular entity type, such as the remaining health for an enemy, but for now we’ll just use the base type for all entities and flesh out its properties and methods over the course of the next articles in the series. Every game entity instance and platform (piece of world geometry) must now have a unique identifier or ID number. For entity instances, the reason is simple: some instances may refer to other instances – for example the portal takes the player to another instance’s location – so we need a way to identify them. For world geometry, there are a couple of reasons: first, similar to above, some instances may refer to world geometry – for example a switch that opens a door (which is world geometry) – so we need a way to identify which world geometry the instance affects. Next, to avoid having to iterate over the entire list of world geometry to find a particular item for this purpose, we change the storage from a vector to an unordered_map (which is the same as how entity instances are stored), where the geometry ID is the map key. The problem with this is that the order in which geometry is stored in the map is not guaranteed to be consistent with the order they are inserted. Since the rendering code iterates over the map from the first to last item and renders in that order, the drawing order of world geometry may change unexpectedly. This is a problem if some geometry is supposed to be in front of or behind other geometry. To solve this, we create a new std::list which does have a guaranteed order, and fill it with ints specifying the IDs of and in what order each piece of geometry should be rendered, then iterate over this list when rendering instead (the geometry with the first ID in the list will be rendered first and the geometry with the last ID will be rendered last). In the source code, an id field has been added to GeometryDefinition and Platform to give world geometry unique IDs, the worldGeometry<Platform> vector in SimplePlatformer.h is changed to an unordered_map and the field list<int> worldGeometryDrawOrder is added in SimplePlatformer.h to store the list of world geometry IDs in the desired draw order. The rendering code is updated to iterate over worldGeometryDrawOrder and find the next piece of geometry to render from its ID, rather than iterating over worldGeometry directly. Since the contents of each GameEntityTypeDefinition are generated when the game starts up and are fixed across the entire game, there is no need to serialize them into the level files. Similarly, GameEntitys are generated on the fly from their corresponding GameEntityDefinitions so these should not be stored either. In fact, the only extra item we need to store store is a ptr_vector of GameEntityDefinitions to give the initial state of each game entity instance. We use standard Boost serialization techniques to load and save (in the editor) levels – see Part 9: Storing Levels in Files / Level Editors and Part 10: Improved Level Management and Storage if you are unfamiliar with this, and to see how the existing level format is laid out and stored. We use the Boost version tracking mechanism described in Part 10 to ensure backwards compatibility with older level file formats. New and changed lines are highlighted. We increment the version number by 1 and add conditional serialization of the game entities for compatibility with older file versions. In GeometryDefinition we update the serialize() code to serialize the world geometry’s ID (or set it to -1 for previous file formats) and increment the version number here too (in SharedPlatformCode.h – not shown here). The implementations of LevelDefinition::Load() and LevelDefinition::Save() are the same as before except we have changed the file format from text to binary to reduce unnecessary bloat in the file size, and world geometry is given arbitrarily generated IDs when loading levels from an older file format (in SharedPlatformCode.cpp – not shown here). Note that the code first serializes the base class, then the derived class’s own extra fields. This simply associates an arbitrary string literal to each serializable class (including the base class itself) which Boost uses as an identifier in the saved file when serializing the class object. For more information, see the Registration and Export sub-sections of the Pointers to Objects of Derived Classes section in the Boost Serializable Concept documentation. This completes the task of updating our level definition class and files, and making sure everything is loaded and saved correctly. All entities of a given type will need the same set of sprites (or sprite sheet) for rendering their animations, and some may be shared across types, but storing them for each entity or even each entity type may waste a lot of memory in duplicates. Instead, we make another dictionary, this time of sprite sheets and again using unordered_map as the dictionary type. We associate each sprite sheet with a string as the dictionary key, and we have already defined a string (sprites) referencing the desired set of sprites in GameEntityTypeDefinition and set the value for each entity type in createGameEntityTypeDefinitions() (GameEntityDefinitions.cpp). We also store the player’s own sprite sheets in the same way (instead of in the separate player variable in the main game class) and adjust the existing rendering code accordingly. In general, we use the filename of the sprite sheet as the string key, and the word “Player” for the player’s sprite sheet. These are arbitrary choices and can be anything you like. Whenever we want to render a frame of animation for a spawned instance, we will use the string key stored in the instance’s corresponding GameEntityTypeDefinition to look up the correct sprite sheet in the spriteSheets dictionary. The implementation of this is shown later on in the series. Finally, we replace all instances of eg. player->DrawPartWH(…) (which draws a frame from the player’s sprite sheet) with spriteSheets[“Player”]->DrawPartWH(…) throughout the entire game code in SimplePlatformer.cpp. All of this hard work won’t actually do anything unless we hook up calls to each GameEntity‘s Update() and Draw() functions in the main game code. Fortunately, thanks to the fact we have developed a class hierarchy which takes of polymorphism, this is trivially accomplished. Right now, this does nothing because we haven’t written the code for GameEntity::Update() or GameEntity::Draw() yet – this will be covered in parts 13 and 14. Should Platforms (World Geometry) and Game Entities be stored in a single game object list? There are arguments for and against this design decision. On the plus side, geometry and entities share some of the behaviours: they have co-ordinates, they may move, they may be spawned and de-spawned and merging the classes allows collision detection to be handled in a unified way. On the other hand, geometry and entities have quite different purposes and we have to draw a line on how generalized we want our code to be at some point. In the framework above, we have kept them separate, but in Part 16 we will indeed merge everything into a single list of game objects with a single base class from which we will make both Platform and GameEntity derive (currently they are separate base classes). One other advantage of doing this is that the draw order of geometry and entities can be interspersed so that entities can be rendered in front of some geometry objects but behind others. In the current code, all entities are rendered first and all geometry is considered to be in front of them. Should the Player be a Game Entity too? Once again there are arguments for and against. The player is the only object in the game world which accepts user input and can move around according to the user’s wishes rather then using pre-defined rules. But once again, it shares much in common with general entity types like sprite sheet usage, animation configuration, co-ordinates and some collision code. If we want to truly unify player-entity, player-geometry and entity-entity collisions in a polymorphic way, making the player its own game entity may be a good choice to avoid duplicating code. For now, we have kept the player seperate, but in Part 16 we will re-write the game code so that the player is also a game entity. Earlier we briefly mentioned that each entity type has a spawn radius. This is the circular (or “rectangular” if you choose to implement it that way) radius from the player at the centre point where entities are spawned. The reason for this is optimization: in a large level there may be hundreds of coins, enemies and other instances, and re-calculating them all every frame is hugely wasteful when you can’t see the majority of them. Therefore, we effectively cheat by not activating (spawning) instances until they are reasonably close to the player; usually just outside the visible area of the level on the screen. When an entity leaves the spawn radius, it is reset to its original position and other default parameters, then de-activated (de-spawned) until it next enters the spawn radius (you need a bit of a buffer outside the visible area otherwise the player may see weird behavioural artifacts as instances near the edge of the spawn radius constantly de-spawn and re-spawn if the player is moving backwards and forwards over the same area). If you run the new code (link at the top of the article) you will see that all of this new work does… absolutely nothing. That’s because we haven’t actually implemented the code to draw or update any entities yet, but fear not! Parts 13 and 14 are devoted to exactly this topic, so keep reading! I hope you found this overview useful. Until next time! Amazing. The best “tutorial” (it’s more than just a tutorial) that I have ever seen. Hi Katy, thank you verty mutch, your Platformer is very cool, great work!